NEW Kingwin KRGB-LED-24 RGB Multi-Color LED Flexible Strip, 24"
Night vision is up to 16-feet. Google Android TV Box. -Sensor: CMOS. -Power port: E27 / E26 screwed thread. -Working temperature:0-50°C. -the color temperature is about 5000K. Local pick up is not available. Feit Electric. This item has many uses such as Yard Light, Light Socket and Barn Light. Energy used: 38-Watt (equivalent to a 300-Watt standard incandescent light bulb). Life hours: 32 years. High output bright LEDs for distance, barns, garages, backyards and work areas that require a lot of light. (2) Philips Hue White and Color Ambiance A19 10w 800 Lumen. Condition: Pre-owner but used very little. Both were tested before being listed for sale. 3 USED HUE WHITE A19 BULBS. Phillps hue stater kit 1 NEW COLOR BULB SEALED IN THERE BOX. BRIDGE INCULDED Play with smart lights There's no limit with Philips Hue: with over 16 million colors, you can transform your home into the perfect party venue, bring a bedtime story to life, and much more. Use preset, colored light scenes to evoke the feeling of summer any time you'd like, or use your own photo to relive a special memory. The GUS Modern Lightbox is a lamp, a seat, and an accent table all in one. It casts a pleasant ambient light for interiors or covered exterior spaces. The cube-shaped shell has no visible seams and creates the effect of a glowing sculpture. Product Features: Touch ON/OFF App Remote ON/OFF 315MHz RF Remote ON/OFF Schedule/Countdown Timers Works with Amazon Echo, Echo Dot, Amazon Tap Works with Google Home, Google Home Mini, Google Nest Works with IFTTT Specification: Working Voltage : AC110-240V(50/60Hz) MaxLoad : 800W/Gang (Resistive load) Working Current : Max 10A Standby Consumption : 0.1mA Wireless Protocal : WiFi2.4Ghz Wireless Range : 30 Meters (Indoor) Switch Standard: US/AU Material: ABS flame retardant. Going on vacation?. Need help waking up?. Create a routine to slowly have lights brighten to mimic the natural sunrise. Kids leave the lights on?. Certified for use with Amazon Alexa, Google Assistant, SmartThings and Wink. New in original boxes. ACE Systems. 2 NEW AND SEALED, 1 HAVE BEEN OPENED. Light Color: RGBW (RGB Cool white). E27 standard socket. Socket Type: E27 (screw type). Power: 10W. (iOS devices need to connect to a computer and open iTunes to sync music files to devices). Wireless IEEE Standards: WiFi 802.11b/g/n. Get started by connecting the included Sengled Smart Hub to a 2.4 GHz wi-fi network. Sengled Smart LED bulbs use 80% less energy than incandescent lighting. Sengled - Smart LED A19 Starter Kit - White Only. Adjustable between warm and cool white. Works with regular switches. No hub required. 65 Watt Comparable. Built in Wi-Fi. This 90-Watt equivalent PAR38 LED uses up to 82% less energy. 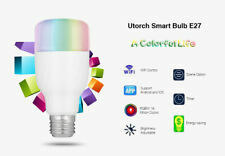 On/off/dim - turn your bulbs on and off, or dim them from anywhere in your house from one or more Bluetooth smart device. Bluetooth compatible. Start of add to list layer. End of add to list layer. Add to a new list. Add to watch list. Add to wish list. United States and many other countries |See details. Hue Color 3pk Starter Kit with Lightswitch. 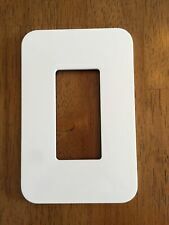 Use screws or the adhesive tape on the back plate of the switch. LED technology. Owner's manual. If no communication is made after a week, we will have to open unpaid item case. See the world in a new light. YEELIGHT bulb provides light together with comfortable experience. A warm bulb with proper brightness could be used for reading, party and also help you get rid of the tired with soft light. Equivalent to 75W bulb. Actual item pictured. easy to set up. Our prices are very competitive, we are. Built in Wi-Fi & LIFX cloud. 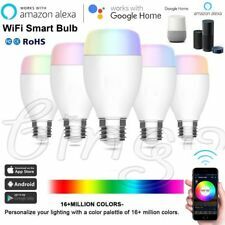 LIFX A19 Wi-Fi Smart LED Mini Light Bulb. Easy set up. LIFX screws in like any traditional light bulb. Simply download the app, connect to Wi-Fi and you're ready to go.